I played this guitar as my personal darling for many years and have decided to pass it along to another lucky player. I purchased this from a small shop and tweaked some features and the setup to suit my liking. I enjoy playing out on occasion and added a K&K pickup at some point along the way. The size, woods and playability are all the bare fingerstyle player needs to breakout in a big fat smile. The warm tone and classic looks is icing on the cake. 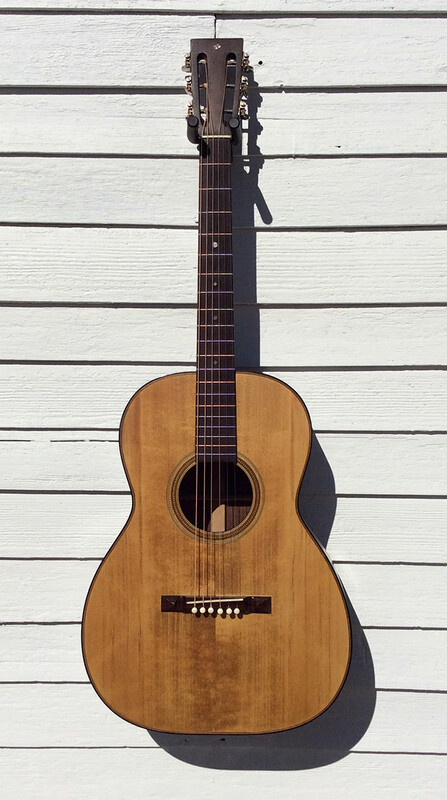 SPECS: 000-size body, 12-fret neck with slotted headstock, mahogany neck with adjustable truss rod, X-braced solid spruce top in natural finish, solid rosewood sides and back in ebony stained finish, bound top and back, neck in black finish, Grover-esque tuning machines, “C” neck profile, rosewood fretboard with new frets, MOP markers, rosewood pyramid bridge, bone pins, nut and saddle. Nut width: 1 3/4”, String Spacing: 2 5/16“, Scale length: 25.5”, Upper bout: 10 7/8“, Lower Bout: 15 1/8”, Body length: 20 3/8”, Widest body depth: 4 3/16”, Overall length: 39 1/2”, Neck thickness at 1st fret: 7/8”, Neck thickness at 5th fret: 7/8”, Action: 1/8”, string gauge setup: D’addario EJ26 custom light gauge in standard tuning. CONDITION: Solid condition with no issues. Three back hairlines repaired, one top hairline repaired, one shoulder crack repaired. Body has scuffs, crazing, squiggles, edge wear, with some binding shrinkage. Other work included neckset, new fretboard/frets, bridge and setup. SOUND: The 000-size “deep body" really delivers the tone. It’s sounds great unplugged but the K&K delivers a clear, unaffected acoustic tone that truly turns heads. Fingerstyle all the way…think JT. >> Click here to return to current inventory.